As some of you doubtless already know, I live in a co-housing community, which is a slightly more capitalistic version of the stereotypical hippie commune. We all own our own properties, pay our own taxes, and participate on a voluntary basis. We do have smaller units in exchange for a large common house and associated facilities, and we have co-housing due in addition to condo fees, which allow people to fund all sort of different projects, from a hot tub, to a community garden, to a fitness room. We use a consensus-based model for decisions, with a vote-based system if consensus fails. One of the many neat projects we have going at the moment is a newly planted apple orchard. 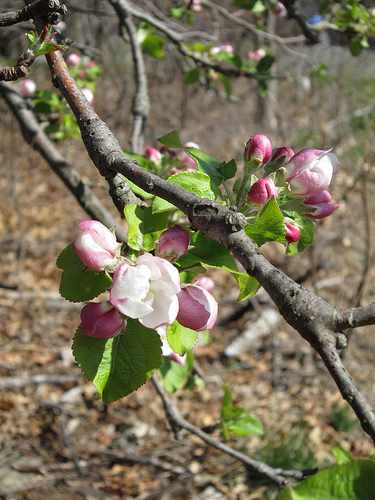 There’s a mix of traditional and heirlooms, along with a nut tree or two–8 saplings in total. I admit to having little interest in what particular trees were chosen, but now that they’re planted, I’m having a great time learning about tree care and orchard principles. We’ve given ourselves the extra challenge of doing things organically, so there’s going to be quite a bit of experimentation (and I’m sure, failure) ahead. I need a new male end! This one will never screw again! The biggest challenge right now is water. We haven’t had rain in a good three weeks, which with new plantings is a major problem. The orchard is several hundred yards away from the nearest spigot, so we needed quite the length of hose–which was promptly hacked up in several places by a well-meaning member of the Mowing Team. Ooops. It was rather fitting then, as I’m attempting to reengage with Water, that I ended up working on repairing the hoses this week. 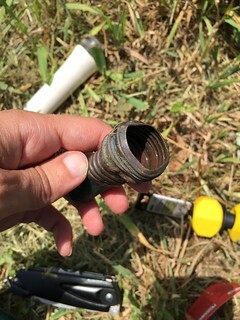 First, figure out the hose diameter, usually either 1/2″ or 5/8″, pack yourself off the the local hardware store, and pick up splicers and/or male or female ends as needed. Also, get yourself a good sharp utility knife if you don’t already have one. (It’s my favorite Scared Druid Tool, with my pruning shears running a close second.) The only other thing you should need is a Phillips screwdriver. Alchemical union of male and female achieved! First, cut out the damaged part of the hose. Keep the cut vertical, since if it’s angled it’s difficult to get a snug fit when you put in the replacement part. Then insert one end of the connector into the hose–you will likely have to be very firm to get things nice and tight. If the hose aperture is really too small, sometimes making a few tiny cuts in the edge of the opening will allow you to get the connector started in the hole. 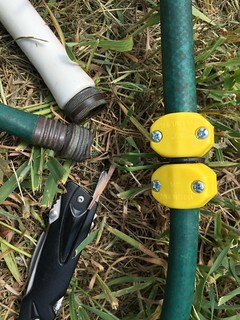 Once it’s in place, and the hose is snug against the connector lip, open up the collar and then screw it down around the hose/collar edge to make the join water tight. Repeat with the other side and ta-da! Non-leaky hose! Preventative measures are always superior: don’t let the hose get kinks, don’t leave it outside for the winter…and for gods sakes, check the grass before you mow! But in case of accidents, now you know how to spend $3 and a bit of elbow grease rather than buying a whole new hose. It’s that whole “reuse” part of the 3 R’s that so often gets forgotten. Happy watering!